191 Commonwealth is located on the NE corner of Commonwealth and Exeter, with 183 Commonwealth to the east, 19 Exeter to the west, across Exeter, 18 Exeter to the north, across Alley 425, and 192 Commonwealth to the south, across Commonwealth. 191 Commonwealth was designed by Weston & Rand, architects, and built in 1872-1873 by Weston & Shepard, masons. 191 Commonwealth was designed as six floor-through apartments, called “French flats,” following the style introduced to Boston (and America) in 1857 at the Hotel Pelham (southeast corner of Boylston and Tremont) and pioneered in the residential portion of the Back Bay at the Hotel Hamilton at 260 Clarendon, built in 1869. 191 Commonwealth was built for Alexander Agassiz, his brother-in-law, Henry Lee Higginson, and Henry Lee Higginson’s father, George Higginson . “Alexander Agassiz and others” are shown as the owners on the original building permit application, dated August 7, 1872, and on the final building inspection, dated December 29, 1873. It was named the Hotel Agassiz in honor of the Agassiz family. The permit application and final inspection report indicate the architects as Weston & Rand, a partnership of Frank William Weston and George Dutton Rand. Correspondence between Weston & Rand and Henry Lee Higginson (in the Henry Lee Higginson Collection at Harvard’s Baker Library and quoted by Margo Miller in her Château Higginson: Social Life in Boston’s Back Bay 1870-1920) indicates that Francis Henry Jackson, an architect and real estate dealer, worked with Weston & Rand on the project. He died in July of 1873 and, according to the correspondence, his responsibilities “both in superintending the work and in the office devolved upon” Weston & Rand. The permit application and final inspection report indicate the builder as Weston & Shepard (spelled Sheppard on both), a partnership of Seth Weston (no relation to the architect, Frank Weston) and George Frederick Shepard. Weston & Shepard were masons, and correspondence and invoices cited by Margo Miller indicate that the carpentry work was done by Morton & Chesley, a partnership of Francis F. Morton and William P. Chesley. The original building was built on a lot with an 84 foot frontage on Commonwealth purchased on March 17, 1873, from the Commonwealth of Massachusetts by George Higginson, Henry Lee Higginson, and Alexander Agassiz. 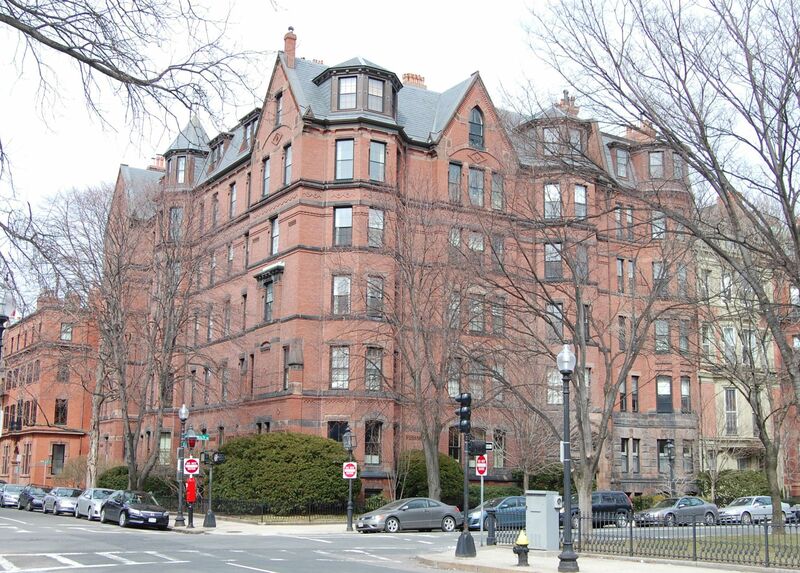 They were the successful bidders for the property at Commonwealth’s March 2, 1872, auction of Back Bay lands, and work on the new building began a number of months before the title was transferred in March of 1873. Click here for an index to the deeds for 191 Commonwealth. Alexander Emmanuel Rodolphe Agassiz was a zoologist and oceanographer, and also was the developer and president of the Calumet and Hecla Copper Mines. His father, Jean Louis Rodolphe Agassiz, was the a noted Harvard naturalist. Alexander Agassiz lived in Cambridge; his wife, Anna (Russell) Agassiz died in December of 1873. George Higginson was a founding partner in the investment banking firm of Lee, Higginson & Co., which specialized in railroad and mining stocks and was closely associated with the Calumet and Hecla company. He lived at 39 Brimmer; his wife, Mary Cabot (Lee) Higginson, died in August of 1849. George and Mary Higginson’s son, Henry Lee Higginson (called “The Major” because of his military service during the Civil War) was a partner in Lee, Higginson & Co., and the husband of Alexander Agassiz’s sister, Ida Olympe Frederika Agassiz. Henry Lee Higginson may be best known for founding the Boston Symphony Orchestra in 1881 and for sustaining it for many years thereafter. Henry and Ida (Agassiz) Higginson lived at the Hotel Hamilton at 260 Clarendon, but moved to the Hotel Agassiz when it was completed and continued to live there for the rest of their lives. He died in November of 1919, and she in May of 1935. On March 12, 1878, George Higginson purchased the 25 foot wide lot to the east of the Hotel Agassiz from the Commonwealth of Massachusetts. On March 27, 1878, he entered into a party wall agreement with Frank Merriam, owner of the land at 183 Commonwealth, and subsequently built an annex to the Hotel Agassiz. The annex took the form of a single townhouse entered through the main building; it became the home of Henry and Ida Higginson. 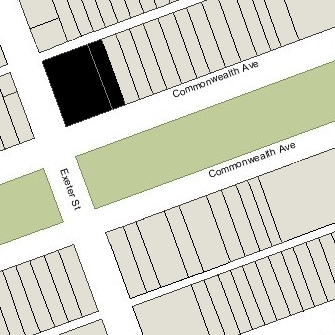 It is shown a separate building, at 185 Commonwealth, on the 1883 Bromley map, but as part of 191 Commonwealth on subsequent maps. Bainbridge Bunting’s Houses of Boston’s Back Bay indicates that 185 Commonwealth was designed by architect James Smith and built in 1883 for William Bradley. Based on the deeds and the Bromley maps, this does not appear to be correct. Bunting apparently erroneously put the information for 179 Commonwealth under his heading for 185 Commonwealth. The original building permit application for 179 Commonwealth, dated March 14, 1883, indicates that it was built in 1883 for William Bradley, and that James Smith was the builder, not the architect (Carl Fehmer was the architect for 179 Commonwealth). George Higginson died in April of 1889. In his will, he left his one-third interest in the Hotel Agassiz to Henry Lee Higginson’s wife, Ida (Agassiz) Higginson. On February 17, 1909, Henry Lee Higginson transferred his one-third interest to his wife. Alexander Agassiz died in March of 1910, and on February 1, 1912, his executors transferred his one-third interest in the Hotel Agassiz to his three sons: George Russell Agassiz, Maximilian Agassiz, and Rodolphe Louis Agassiz. The property continued to be owned by Higginson and Agassiz family members until 1951. By 1935, the number of units had increased from six to nine. 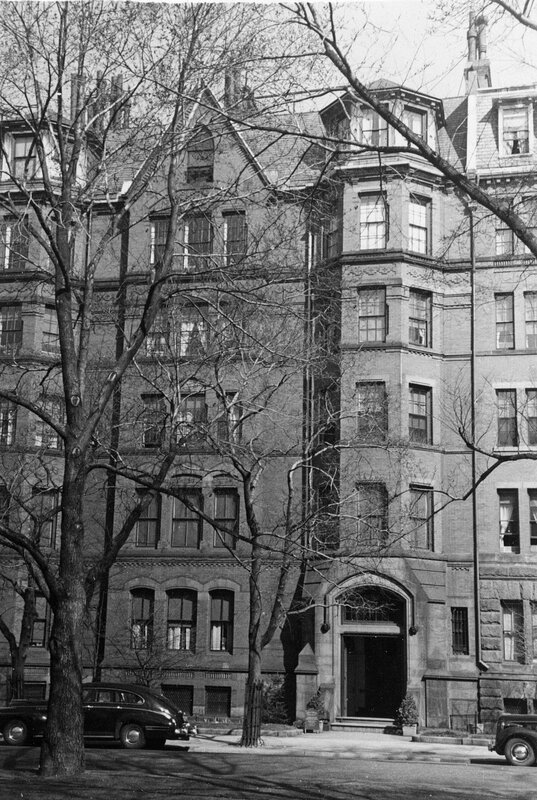 Between 1935 and 1938, several of the larger apartments on the third, fourth, and fifth floors were subdivided, and the number of units increased to fourteen. In 1952, a larger apartment on the second floor was subdivided into three, and the number of units increased to sixteen. On April 26, 1951, 191 Commonwealth was purchased from the Higginson and Agassiz families by Miss Clara Rita Drucker. She was a law office secretary and probably held the property for someone else. In about 1964, she married to Harry Keimach. On August 26, 1964, 191 Commonwealth was purchased from Clara Keimach by Beatrice M. Coulter, and on April 30, 1965, it was acquired from her by Nicholas D. Rizzo, trustee of the Munick Realty Trust. 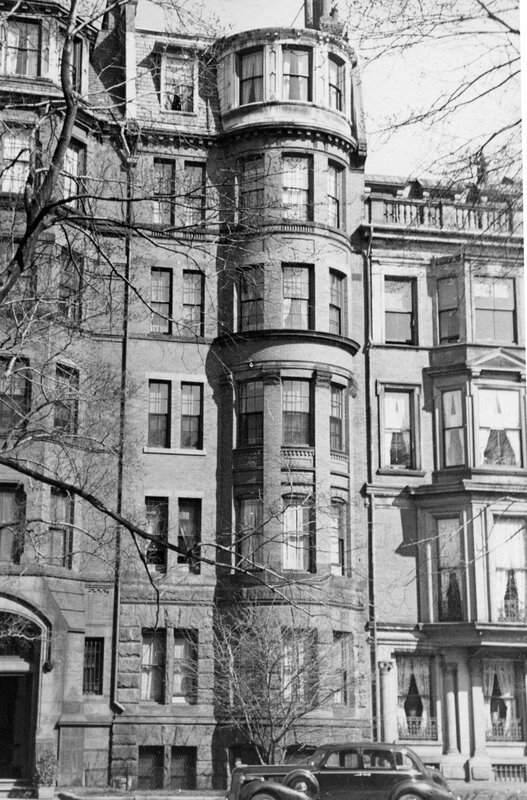 On May 18, 1973, Nicholas Rizzo converted the property into 16 condominium units, the 191 Commonwealth Avenue Condominium.